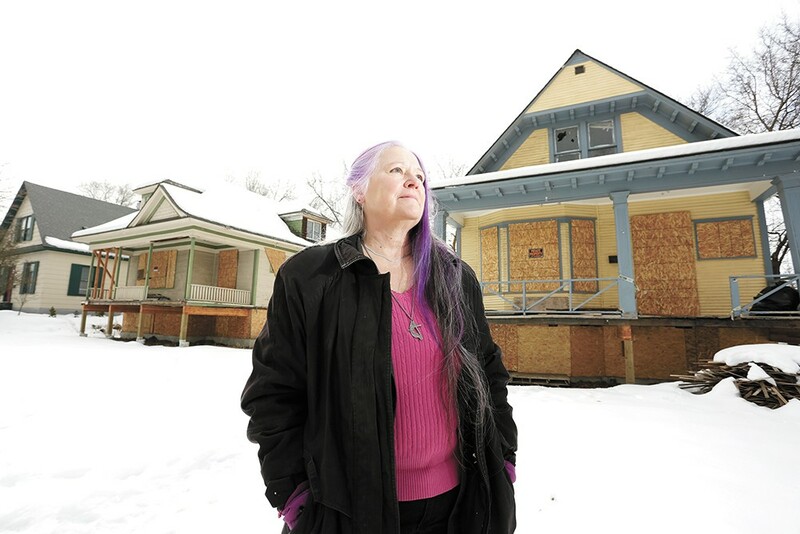 Deb Conklin stands in front of boarded-up homes she hopes to convert into affordable housing. Spokane's West Central Neighborhood loves its Victorian architecture. And the city as a whole needs more housing. That's why a plan hatched in 2016 to renovate five aging homes into roughly 35 affordable units seemed promising. But as the project's backers quickly found out, the world of housing construction can be unforgiving. Several years in, the project has stalled, and the city of Spokane is threatening to demolish the homes unless the Grove Community, a small local social-justice-minded nonprofit that owns the properties, sells them. Depending on who you ask, the action is either a noble effort to save the neighborhood from "blight" or an ill-founded governmental overreach. To Deb Conklin, a local pastor and co-director of the Grove Community who helped spearhead the renovation project, the situation is somewhat Kafkaesque: "I've never heard of anything that has less fairness and due process to it," she says earnestly. "The best intentions to create affordable housing and preserve the integrity of the neighborhood with these old historical homes has actually created blight in the community," says Assistant City Attorney Matthew Folsom, who is leading the city's crackdown on the properties. Here's what happened: Back in 2015, Sarff Investments bought up a slew of parcels along Maple and Ash Streets in West Central, with plans to build a carwash. Keith Kelley, a local neighborhood activist who was interested in preserving the roughly 100-year-old homes, negotiated with the company to acquire them for basically nothing so long as they were moved off the parcels and someone else paid for it. After obtaining a $650,000 loan from St. Paul's Methodist Church — the credit was given on the understanding that it would eventually be paid back from the properties' rent revenues — the Grove Community purchased five lots in West Central with the intent of moving the homes onto them, Conklin says. The vision was to turn the homes into affordable single-occupancy rentals for "people who need houses," such as kids coming out of the dysfunctional foster care system and formerly incarcerated people, Conklin says, adding that the lots would feature community gardens that the tenants would manage. But problems started cropping up: One of the early contractors, who was supposed to move the homes and renovate them, allegedly pocketed a substantial portion of the $650,000 in financing before running out on the job. ("$450,000 of it went to the contractor who absconded," Conklin says, though no one was charged.) The group then ended up searching for a new contractor for over a year. In the summer of 2017, people began dumping trash on the lots and squatting in the houses, raising eyebrows with city code enforcement and several liens were also placed on the properties. "The longer they sat, the more we had people camping in them, trashing them," says Karen Stratton, a City Council member who represents the West Central Neighborhood. "We had more and more neighbors complaining that the houses were sitting empty." By December 2018, Spokane Code Enforcement had declared the buildings substandard and ordered that they be demolished after 90 days if Conklin and the Grove Community couldn't come up with a new plan. Given the mounting issues, Stratton says that she contacted the city's legal department and other stakeholders to explore alternative options for the lots. Now, the city, through the Police Department's civil enforcement unit, has deemed each of the properties a "chronic nuisance." Folsom, the assistant city attorney, cites a visit to the properties in early February when staff saw "evidence of squatter activity." Folsom couldn't point to any significant disturbances or trends of routine threats to public safety stemming from the properties beyond their unsecured nature. Folsom argues that the city would prefer not to demolish the properties and sell them to the highest bidder, as is required by statute. Instead, he says he wants to continue Conklin's vision by getting her to agree to sell the property to a new owners on the condition that they provide affordable housing and rehab the homes. "This is a chronic problem. There's a lot of people without housing." "The Spokane Police Department and the civil enforcement process is the only thing standing between those properties and demolition," he says. Conklin, meanwhile, rejects the notion that the properties are abandoned or a nuisance. "We solved those problems. I've not seen evidence of any squatters in the last nine to 12 months," she says. "We've boarded the houses up." Valin Davis and Lisa Tyler, residents at a house adjacent to the house on West Maxwell, say that people routinely occupy the boarded-up house. "They have been [there] since last summer," says Tyler. "They're in and out." Kathryn Wilson, trustees chair at St. Paul's Methodist Church, says that the squatting is evidence of the need for the project. "If people want to get in, they can get in," she says. "This is a chronic problem. There's a lot of people without housing." Weighing over the situation is the sizable $650,000 loan that St. Paul's Methodist Church sunk into the project. Both Conklin and Wilson are concerned that in both of the scenarios presented by the city, the church won't recover its money if the property were to end up in someone else's hands. Conklin argues that the likely market-rate values of the five properties are significantly less than the $650,000 loan, considering that the city would take a chunk of any sale proceeds to pay off several liens. Currently, Folmer says, the civil enforcement unit is working to "pause the demolition" while he tries to get Conklin to agree to sell the property: "If we fail for some reason, then they'll follow through with the demolition order." Another option would involve Conklin and the Grove Community coming up with a plan that includes financing and an established contractor. Conklin says they have a new contractor, David Trowbridge, and that they're working on finding investors quickly. The original print version of this article was headlined "Punctured Dreams"